The Muslim Legal Fund of America is a non-profit organization which has existed since 2001. It supports legal cases across the country which impact civil rights, freedoms, liberties and principles of justice in America, particularly where Muslims are concerned. The organization focuses on important cases which affect the Muslim community and public policy. Their decisions about which cases to take up, therefore, are strategic. 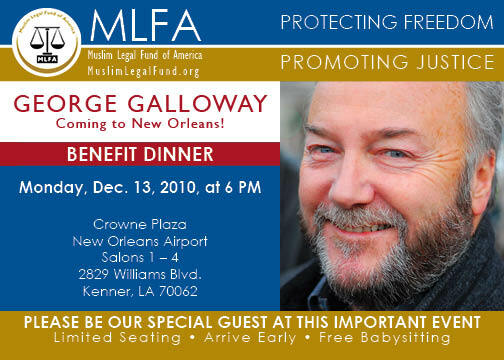 Last night the MLFA hosted a benefit dinner in Kenner, Louisiana . Kenner is a smaller city that borders New Orleans. The benefit was intended to raise funds for the organization’s work and to raise awareness about ongoing injustices facing Muslims in the United States. Around 100 people attended, with the majority being Louisiana Muslim community members. A handful of non-Muslims were there as well. Speakers included Adulrahman Zeitoun, a Syrian-born New Orleans businessman who has achieved a degree of fame because he rode out hurricane Katrina and then went around rescuing people in his canoe. For his good work he was arrested, labeled a terrorist and imprisoned for 23 days. The daughter of Shukri Abu Baker also spoke. Baker was the president of the Holy Land Foundation, which was the largest Muslim charity in the United States. In the aftermath of September 11, the Bush regime charged the organization with supporting Hamas in Palestine. The organization was subsequently shut down and Baker is now serving a 65-year prison sentence, essentially for providing charitable aid to victims of the ongoing genocide in Palestine. All of the speakers gave powerful and moving presentations. The keynote speaker was former U.K.-parliamentarian and long-time activist, George Galloway. Galloway is known for his activist work in support of Palestine. He is a founding member of a charitable organization called Viva Palestina, whose mission is to break the blockade of the Gaza strip by bringing badly-needed aid. For these activities, he was denied entry into Canada from March of 2009 until October 2010. He has not, however, been officially blocked from entering the United States. You can imagine the surprise of the audience last night when it was announced that Galloway would not be speaking with them in person, as he had been denied entry into the United States over the weekend. He was supposed to be traveling the country for a multi-city speaking tour, but was told by airline officials that he would not be able to enter the U.S. because there were problems with his visa. Undeterred, Galloway instead addressed the crowd in Kenner via the computer program Skype. A laptop was hooked up to a projector, and a live video could be seen on two large screens in a convention room of the Crown Plaza hotel, where the event was held. During his talk Galloway stated that it is not clear whether his being denied entry was the result of a technical or bureaucratic glitch, or whether it was a political measure carried out in secrecy. He explained that efforts were made to resolve the situation throughout the weekend, but that nothing came of it. The main body of his talk concerned human rights violations carried out by the U.S. government against Muslims worldwide, and particularly the grave humanitarian situation in Palestine, which has resulted from Israeli-U.S. imperialist settler policies. He went on to describe his speaking visit to New Orleans last year. He said that New Orleans is a city which he loves deeply, and that he has every intention of visiting it again, and speaking to New Orleanians again. He vowed that he would fight to get back into the United States and that this event would be rescheduled. When speaking about the Muslims, solidarity activists and charitable workers who have been the target of political repression in the United States since 9/11, he argued: “Anyone of you as I look around this hall could be the next one to hear the knock on the door, to be unjustly accused…even because you’re doing charitable work for a country that has been wiped off the map.” He was referring to Palestine. Galloway’s provocative statement that he “cannot be silenced” because “we live in the age of Skype, YouTube and Facebook” is particularly pertinent at this time. People have been talking about the political implications of the digital revolution since it began, just as people in other eras discussed the political implications of other media and technological shifts. But in the wake of the WikiLeaks revelations and other events this year (such as FBI raids on anti-war activists) the contradictions implicit in this social revolution are perhaps clearer than ever – and they are certainly heightened. These contradictions are increasingly characterizing the contemporary world, and, broadly speaking, they boil down to this: the new digital media open up the way for new democratic transformations and unprecedented levels of openness in public institutions on the one hand; on the other, they open up possibilities for frightening forms of surveillance, opacity and authoritarianism. A resume of U.S. government activities since the Bush administration should leave no doubt about the latter tendency. At one level these contradictions are overdetermined by another prevailing social contradiction which is inherent to capitalism, and that is the contradiction between massively-socialized production and economic life generally, on the one hand, and private ownership on the other. (The struggles over intellectual property, file sharing etc. all take place within the trajectory of this contradiction.) At its base, this contradiction is about who has power in society and who does not. It is increasingly clear that the new digital technologies make governments, corporations and other powerful entities newly powerful but at the same time newly vulnerable (just look at the attacks on the websites of Visa and MasterCard by “hacktivists” following the latest round of leaks by WikiLeaks). The same is true of the people who are resisting the powerful. For example, these technologies make it easier for governments to spy on activists, but they also provide the means of organization for those activists. It should be noted, in regard to the 2010 FBI raids on anti-war activists, that because of social networking sites like Facebook, an organized response was beginning the very day that the raids were taking place. Within hours there were videos on YouTube. Press conferences, demonstrations and the like were all in the works. 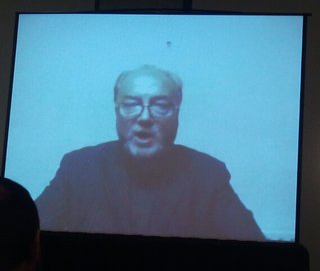 Galloway’s appearance via Skype last night highlights the liberatory dimension opened up by these technologies. Whether the U.S. government is in fact preventing him from entering the country, or whether there was a technical glitch does not change this. The fact is that his lack of physical presence did not prevent him from addressing Louisiana community members. He was not prevented from speaking. George Galloway is a British politician, author, broadcaster and former Member of Parliament. He is the founder of the Respect Party and is a peace advocate. He is most known for his outspoken views on Palestinian rights. Mr. Galloway is an avid supporter of MLFA and is coming to speak about important issues affecting you. Don’t miss this opportunity to listen to a world-renowned activist speak about his experiences on the front lines of the fight for peace, liberty and equal justice for all. The Muslim Legal Fund of America is a 501(c)(3) nonprofit charitable organization that supports legal cases across the country which impact civil rights, freedoms, liberties and principles of justice in America. MLFA is comprised of staff, volunteers and supporters from all walks of life who have one thing in common: the belief that treating people unfairly because of their religious beliefs undermines the core values that make America great. There will be a demonstration held in Birmingham Alabama at Five Points South on Sat. August 21st, 2010 in front of Highlands United Methodist Church, 1045 20th Street South Birmingham, AL 35205-2623. It will be held from 5:00PM until 6:30PM. Demonstrators will be responsible for bringing their own sign, banner or flag. For any further details contact Dustin Getz at birminghamsds@gmail.com. Demonstration hosted by Students For A Democratic Society, Fight Imperialism Stand Together, Birmingham Peace Project and Mas Youth. There have been a few noteworthy events in Florida recently. – As part of the national “Seize BP” campaign: Destin, Ft. Lauderdale, Ft Myers, Key West, Miami, Orlando, Tallahassee, and Tampa all had demonstrations in support of the call to seize BP’s assets as BP’s oil began to wash up on Florida’s shores in greater numbers. These rallies drew out large crowds and quite a bit of support (and a note that many other cities across the South held these BP demonstrations in Georgia, Texas, Louisiana, Kentucky, New Mexico, and Virginia). The idea that BP can just be boycott in general raises a few questions that those who argue for a boycott seem to not have thought out. For example: what is the alternative (although perhaps some Leftists will argue that we should all shop at Citgo perhaps 😉 ) But what kind of lifestyle politics is “watch where you shop for gas” in the first place? This is why ANSWER launched the Seize BP campaign: it’s the solution to this problem, and would put the assets of BP in the hands of those affected. Also, something the Seize BP campaign has been questioned about many times thus far is the question of “why allow the Federal Government, who was complicit in the crisis in the first place, be allowed to handle the assets.” There’s the first point of: they seem to be the only entity actually capable of such an action of seizure. The second point is that the Seize BP campaign doesn’t call for those responsible for this crisis to be the administrators of such a trust that would be created from the assets, but calls for those affected (fishing and shrimp workers, BP workers, etc.) to be in charge of such a trust. – There have also been various demonstrations in relation to the recently Israeli attack on the flotilla on its way to Gaza. ANSWER coalition called for demonstrations in Tampa and Orlando, while the ISO of Gainesville held a demonstration on Monday. These demonstrations had a clear message: opposition to Israel’s attack and a call on the US government to join in with the rest of the world in condemning the attack and stopping military support to Israel. While there were various demonstrations condemning the attack around Florida, in Miami, there was a pro-Israel demonstration where some demonstrators even claimed that the Obama administration is going too far in “defending those who want to destroy Israel” (thus we see both demonstrations issuing out harsh criticism of the current administration). The more reactionary tone of the Miami demonstration doesn’t come as a surprise to Leftists (especially those in Florida) as it’s well known that many reactionary groups are based there. 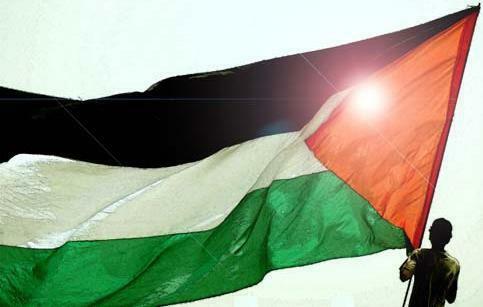 In response to the recent fiasco with the Freedom Flotilla and the many other human rights abuses practiced by Israel, there will be a demonstration held in Birmingham Alabama on June 19, 2010, at the fountain located in Five Points South. Directly in front of Highlands United Methodist Church, 1045 20th Street South Birmingham, AL 35205-2623. It will be held from 4PM till 5PM, demonstrators will be responsible for bringing their own sign, banner or flag. For any further details such as directions contact Dustin Getz at birminghamsds@gmail.com. Demonstration hosted by Students For A Democratic Society, Fight Imperalism Stand Together, Birmingham Peace Project and the Birmingham Islamic Society.